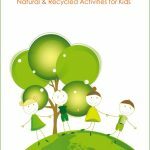 Did you see the book that I published recently? 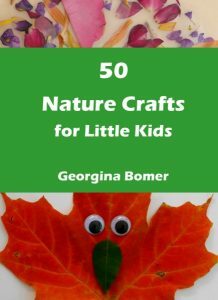 50 Nature Crafts for Little Kids is filled with crafts inspired by nature, and crafts that use natural materials. 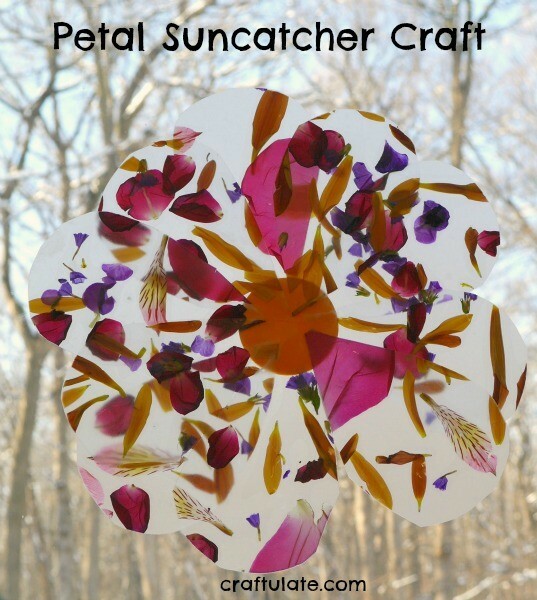 I separated the book by season, and today I wanted to share one of my favourite crafts from the Spring section – a beautiful suncatcher made from real petals! Cut two large pieces of Contact paper, peel the backing off one and put the other piece aside. Tape the Contact paper to the table (sticky side up) to keep it in place. 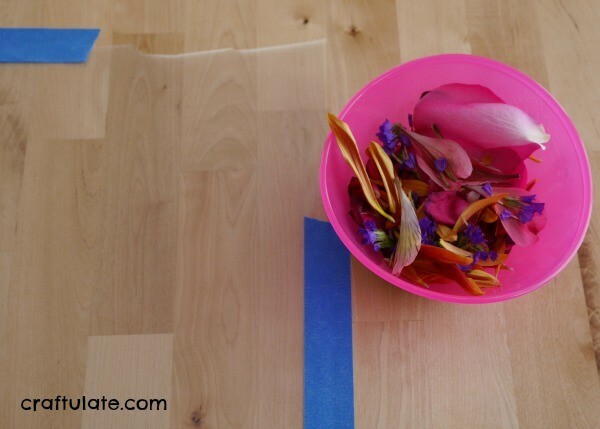 Provide a bowl of the petals – this can be a great use of fresh flowers that are starting to shed their petals! 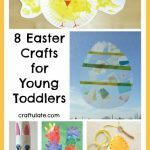 Invite your child to get creating! 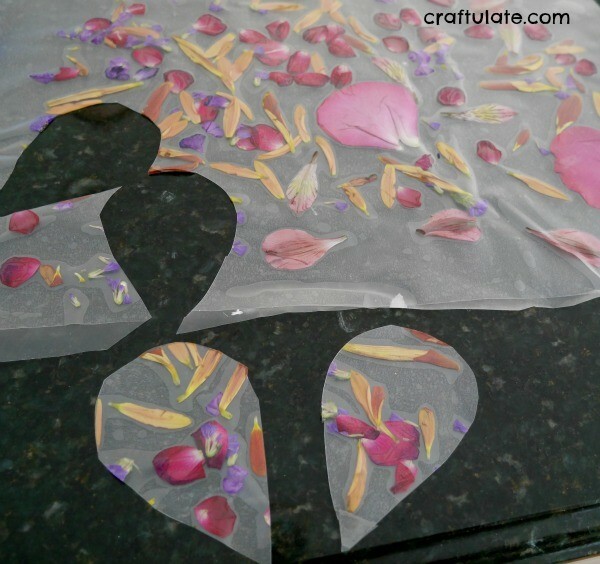 Once they have used up all the petals, peel the backing off the other piece of Contact paper and carefully place it over the top of the petals, sticky sides together. Try and avoid air bubbles! 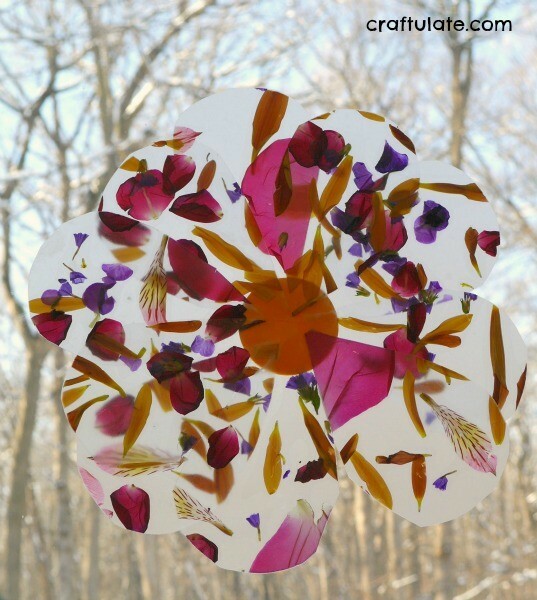 This would make a lovely suncatcher if left whole (with edges trimmed) but to make it into a flower cut as many petal shapes as you can from the collage. 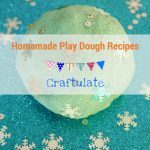 Use a circle punch (or freehand cut) a circle from the yellow card. Glue or tape the petals to the yellow circle. 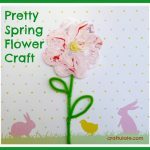 Let the glue dry and tape the pretty petal suncatcher up at the window to catch some of that spring sunshine!! 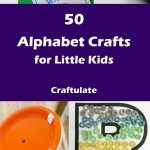 If you liked this activity please check out the other 49 activities in 50 Nature Crafts for Little Kids available in ebook, paperback and Kindle formats!